Samford University's Ida V. Moffett School of Nursing has received the third largest award nationally of the 92 Nurse Faculty Loan Program (NFLP) grants for 2014-15. This is the 12th year for Samford to receive the grant from the U.S. Department of Health and Human Services, Health Resources and Services Administration (HRSA). Samford's grant of $1,310,955 is third only to Case Western Reserve University in Ohio and Wayne State University in Michigan. It is one of only four grants nationally that exceed $1 million. Samford received the largest of five grants in the state of Alabama and was more than double the combined grants of other Alabama institutions. The University of Alabama at Birmingham ($248,809), the University of Alabama ($119,984), the University of South Alabama ($108,976), and the University of Alabama in Huntsville ($92,408) also received grants. The grants are designed to help ease a national shortage of nursing educators, according to Jane Martin, associate nursing dean and the HRSA grant administrator at Samford. Students who receive loans for master's or doctoral degree programs can have up to 85 percent of the loan forgiven in exchange for service as full-time nursing faculty members at an accredited school of nursing. Students continue to receive funds for the duration of their degree program as long as they maintain good academic standing. "The need for professional registered nurses is growing rapidly, yet faculty shortages in nursing schools are limiting student capacity. As we prepare for the projected need of 1.2 million RN positions in the U.S. by 2020 and a projected wave of nursing faculty retirements in the next five years, this Nurse Faculty Loan award allows the Ida V. Moffett School of Nursing to address this need in Alabama as well as other states in the nation," said Martin. According to a report by the American Association of Colleges of Nursing (AACN), U.S. nursing schools turned away 79,659 qualified applicants from baccalaureate and graduate nursing programs in 2012; 2,396 of those applicants were in Alabama. Almost two-thirds of the nursing schools responding to the survey pointed to faculty shortages as a reason for not accepting all qualified applicants into entry-level baccalaureate programs. The NFLP was approved by Congress in 2002, and Samford was one of the first 55 nursing schools from across the U.S. to receive funds. Samford's NFLP grants now total more than $5.4 million. The 2014-15 grant is expected to help up to 87 students at Samford. Martin noted that in 2013-14, Samford was able to use HRSA grant funds to help students from 16 different states extending from Massachusetts to California. 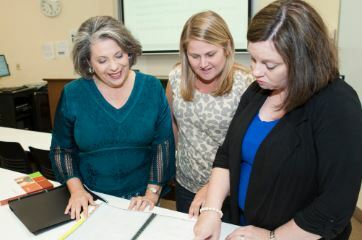 To date, over 200 students have benefitted from NFLP loan awards at Samford and are serving as nurse educators across the country. Martin added that graduates have benefitted from academic programs that are specifically designed for students planning to teach full-time in nursing. "Preparing nurses to assume faculty positions is one of the priorities of the Ida V. Moffett School of Nursing. Our graduates are able to seamlessly assume faculty positions in areas of need," said Martin. These graduates are accepting not only teaching positions, but also nursing academic leadership positions throughout the country.